This Midland band evolved from The Doc Thomas Group, a Hereford-based pub rock/covers band which included Peter 'Overend' Watts, Dale 'Buffin' Griffin, Michael Ralphs and Terence Verden Allen, who played with very little acclaim around the Welsh borders circa 1966/67. They also spent some time in Milan, Italy, with vocalist Stan Tippins now added to their line-up, where they got to record an album and upon returning to Britain moved from Hereford down to London changing name to The Silence (which Watts and Griffin had used for an earlier combo after leaving school). They soon came to the attention of Guy Stevens who became their manager and producer. Tippins, who yearned for the warmer climate of Italy soon left and Stevens renamed the remaining members Mott The Hoople after a 1967 novel by Willard Manus. He also placed an advert in 'Melody Maker' for a new vocalist. It read, "Singer wanted, must be image-minded and hungry". He recruited Shrewsbury-born Ian Hunter whose real name was Ian Patterson. Hunter had previously been in At Last The 1958 Rock 'n' Roll Show. 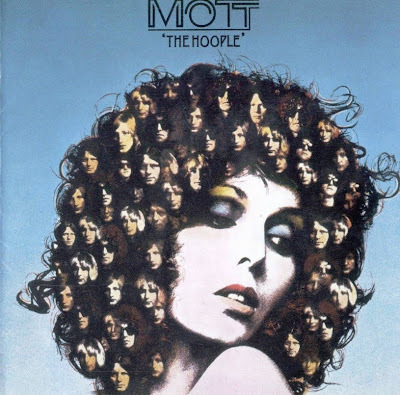 In July 1969 the band hastily recorded a dozen songs for Island and these comprised their debut album, Mott The Hoople, released in December of that year. Stevens had originally wanted to name the album 'Talking Bear Picnic Massacre Dylan Blues' but this was overruled by Island who thought the title too stupid. It is rumoured that some white label copies were pushed out bearing this title. I can't confirm this but if any exist, they would be extremely collectable. The first 5,000 copies included the flip of their first 45, The Road To Birmingham, instead of the 'A' side (Rock'n'Roll Queen). These also sell for more than the correct pressings. Hunter was an avid Dylan fan and his similar vocal style was highlighted on the album, which included covers of Sir Douglas Quintet's At The Crossroads and Sonny and Cher's Laugh At Me. Many find the album's organ-led sound reminiscent of Dylan's Blonde On Blonde period. Although the Rock'n'Roll Queen 45 failed to chart the album slowly climbed to No 66 in the UK and No 185 in the US the following year. After touring both the UK and US the band began work on their Mad Shadows album, which was more inspired by The Rolling Stones than Dylan and captured Hunter in a more forceful mood. Released in mid-1970 it received quite good reviews but its sales were mediocre (it crawled to No 48 in the UK) and this put pressure on the group's finances. They therefore decided to produce the next album, Wild Life, themselves. It was recorded over a seven months period between February-September 1970 and severely hampered by the band's lack of finances and the band's lack of production experience. The end result was a mess. The only redeeming feature was a belting 10-minute version of Little Richard's Keep A Knockin'. Most of the remaining material sounded like a poor man's Bob Dylan. Understandably Island's promotion was half-hearted and after peaking at No 44 in the UK Charts it soon sank without trace. In an attempt to salvage some credibility the band enlisted the services of George 'Shadow' Morton to help produce an unashamed assault on the singles Chart, a Stones-influenced original with a sing-a-long chorus called Midnight Lady. It got them a 'Top Of The Pops' appearance but failed to mount an assault on the Charts. Their next album, Brain Capers, was more heavy-metal in style, successfully capturing the band's endless on-stage energy. Indeed they'd built up quite a reputation as a live act. One of their concerts at the Albert Hall had caused a minor riot leading to a ban on future rock concerts at the venue. Still the Brain Capers album didn't chart and this led to the band being dropped by Island. In retrospect its main significance was to attract the attention of David Bowie, who'd in any case been a long time fan of theirs. Hearing that they were going to dissolve after a concert in Zurich, Switzerland, he offered them one of his new songs to continue in business. After rejecting Suffragette City they choose All The Young Dudes. Bowie even set up a recording session and his manager, Tony de Fries, touted the resulting tape around the record companies until CBS picked it up and offered them a five year recording contract and considerable freedom provided they used Bowie as their producer. So All The Young Dudes was the 45 that turned their career around. It got to No 3 here and No 37 in the US. The album of the same name, which included contributions from Bowie and his guitarist Mick Ronson, climbed to No 21 here and No 89 in the US. In the Summer of 1972 the band set off on a series of UK headline provincial gigs followed by a five week US tour designed to cash in on their new success and their relationship with Bowie who was hot in the US at this time. Upon their return home Allen quit to form an extremely unsuccessful outfit called Verden Allen's Soft Ground and the band continued as a quartet. Their next album, Mott, was their best to date. It produced two hits, Honaloochie Boogie (UK No 12) and a song which soon became another of their anthems, All The Way To Memphis (UK No 10). It later appeared on the Soundtrack to 'Alice Doesn't Live Here Anymore' in 1975. The album got to No 7 here and No 35 in the US, but soon after their success guitarist Mick Ralphs, tired of his reduced vocal assignments, departed to form Bad Company. He was replaced by former Hellions and Spooky Tooth axeman Luther Grosvenor, who was now calling himself Ariel Bender. He filled in on a 'Top Of The Pops' slot to promote their next single, Roll Away The Stone. Another classic 45, which became something of an anthem for them, this got to No 8 in the UK. January and February 1974 were mostly spent working on a new album, The Hoople. The band were supplemented by Howie Casey (sax) and backing singers Barry St. John and Sue and Sunny (who'd previously worked with Dusty Springfield and T Rex). The album certainly had its highlights. Aside from Roll Away The Stone it spawned Golden Age Of Rock And Roll, a glorious single which climbed to No 16 here and No 96 in the States. The album, meanwhile, rose to No 11 here and No 28 in the US. June 1974 saw the publication of Hunter's book, 'Diary Of A Rock'n'Roll Star', which gave a day by day account of their 1972 US tour. It was also serialised by 'N.M.E.' here and by 'Creem' in the US. The band's next 45, Foxy Foxy, paid homage to sixties girls groups but its progress was arrested at No 33 in the UK Charts. The follow-up, Saturday Gigs, a tongue-in-cheek recital of the band's rise to fame, only managed No 41 and Ian Hunter suffered a nervous breakdown. To keep interest in the band alive CBS released Mott The Hoople - Live, which was compiled from concerts recorded at London's Hammersmith Odeon in November 1973 and New York's Broadway in May 1974. It certainly didn't capture the band at its best, although it contained reasonable versions of some of their epic songs like All The Way From Memphis, Rest In Peace and All The Young Dudes. With Hunter not having made a full recovery the band decided to split in December 1974. The following month Hunter and Ronson put together The Hunter-Ronson Band to promote the solo albums on which they were both working. Buffin, Watts and Fisher, meanwhile, re-grouped and with the addition of new members Ray Major (gtr) and Nigel Benjamin (vcls) continued playing as Mott. Under this monicker they recorded the dreadful Drive On and the somewhat better Shouting And Pointing. It soon became apparent, though, that the chemistry wasn't right and when Benjamin left in November 1976 Mott split.